Vendors are now able to contact owners of the marketplace directly from store dashboard. The weForms-Dokan connection is a free form integration that lets you create a customized Vendor Contact Form and deploy it in your online marketplace. Dokan visitors and customers have had a couple of robust mediums to connect with their vendors, such as, store support ticketing system, live chats, and product enquiry. However, vendors did not have an option to contact admins and owners directly unless they had exchanged emails or other means. And, as expected, this was a highly demanded feature amongst sellers from our users. So…here it goes. You asked, we heard! 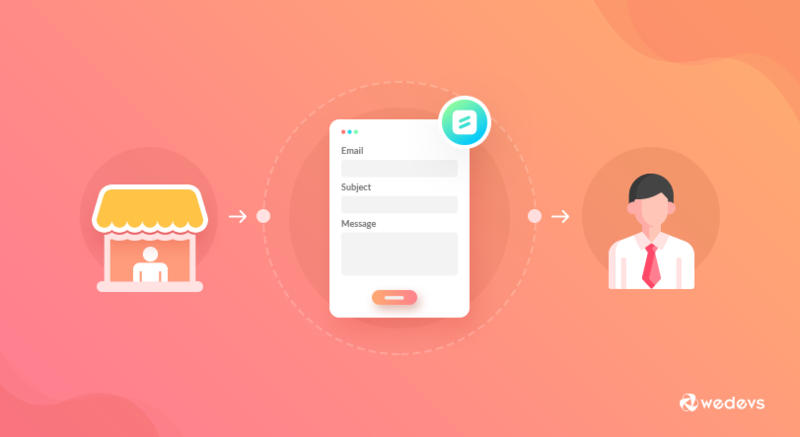 This contact form integration for Dokan is one of the simplest and must-have features that have been developed in the recent past for this eCommerce plugin. And it's simple to configure as well. 1. Ensure you have installed at least weForms 1.2.9 and Dokan 2.8.2 versions of the plugins in your WordPress dashboard. 2. Now navigate to wp-admin>weForms. Click on Add Form. 3. Select Vendor Contact Form from the given templates. This is the default built-in template for Dokan-powered marketplace vendors. And it's completely customizable! Click on Create Form to get started. 4. Now the form editor will open and from here you can modify your form as you like. Such as, add or change fields, set up email notification settings, set up entry limits, schedule form, or configure it with other integrations. Ensure to click on Save Form to save all changes and activate the form for use. 5. Go to wp-admin>Dokan>Settings>Vendor Contact Form. Enable the check-box Allow Vendors to contact Admins from the dashboard area. 6. You can change the default section label [Contact Admin] that will appear in the store sidebar to anything else that is more appropriate for your marketplace. 7. Finally, select the Vendor Contact Form from the drop-down in the third field. If you want to use a different contact form ensure you have it set up in weForms and saved. Then select your chosen form from the drop-down. Watch vendors now contact you in no time! When the vendors signs in, he can view the new sidebar label in his dashboard. The auto-populate feature of weForms extracts the field data from the profile of the vendor. This is logically enabled for Username and Email Address by default in weForms for the vendor contact form. Logged in vendors will have their usernames and email address auto-populated and hidden since this is selected to be the case by default in the Vendor Contact Form template. Admins can choose to alter this feature. Admins can modify the default Thank You message that appears after vendors hit Submit Query, and customize it from the Form Settings of weForms. Vendors submit. Admin receives. There's no delay. Upon submission, the entry will be instantly received and stored in weForms which the Admin can access in weForms>Entries. This is the submissions manager from where the Admin can view, edit, delete and do more with the entries of each of his forms. The Details tab will show the complete message of the vendor to the admin along with other info, such as, date of submission and device used. Admins can use any form to deploy to the vendor dashboard sidebar, and it's not a must to only the vendor contact form. You can create a new form from scratch or you can choose another of weForms' templates as the vendor's form. Just that: make sure you select the right one you want to use from Dokan Settings. You can also change the default settings of each form anytime you need, and the changes will take effect immediately. Checkout the official documentation for more helpful info. There's a lot more to weForms! If you are a creative admin who likes to experiment, you would love the host of customization features that's pre-built in weForms. Schedule the form for a certain time period, limit the number of entries, set up email notifications, change your Thank You message or use 20+ custom and advanced fields with CSS class options. You can also take advantage of the free API integrations with some of the bigshot solutions that range from CRM to email, marketing, and even productivity. weForms Free is sufficiently feature-rich to cover the needs of your online eCommerce. And it's not a complicated one! weForms is totally crafted for the beginner user and intuitive enough to learn without a guide. Do you have Dokan developer license?